Multiple Exposures Gallery invites you to our new exhibit: LIVING YESTERDAY TODAY - Images by Sandy LeBrun-Evans. been like stepping back in time capturing the reenactors Living Yesterday Today. 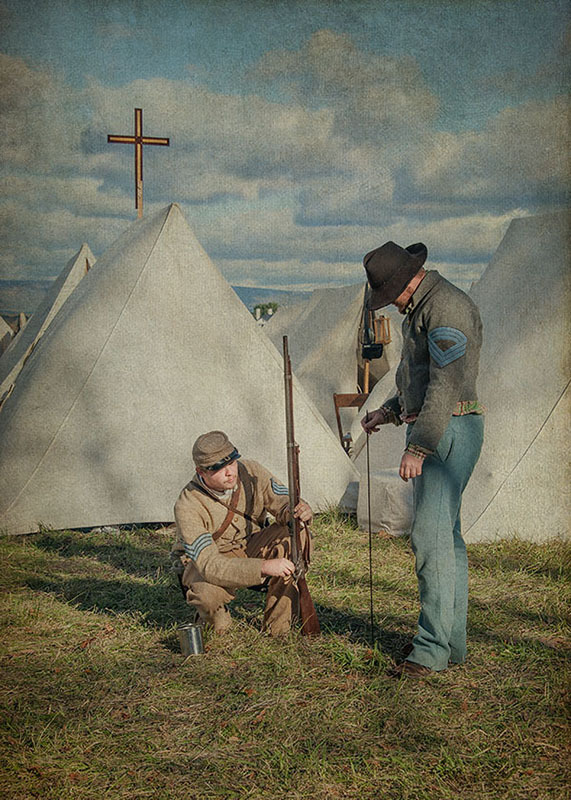 MEG member Sandy LeBrun-Evans is building LIVING YESTERDAY TODAY, a new portfolio filled with images of Civil War re-enactors. Below she shares why finds re-enactors and the battles they fight to be such interesting subjects. I became hooked on photographing civil war re-enactors completely by accident. Driving home one evening, I noticed a sign on Interstate 95 that indicated a re-enactment would take place the next day. I thought, “Why not check it out!" I was amazed and hooked from my very first visit. Re-enactments include both battles and the re-enactors living, eating, playing as they did during the Civil War period. As I wandered around the camps of the Northern and Southern armies, everywhere I turned there was a vignette of the past. In 2013, the 150th anniversary of some very important battles was commemorated, and a number of battles were re-created, including Antietam/Sharpsburg (the name of battle depended on which side of the war you were on), Chancellorsville, Fredericksburg and Gettysburg. Each re-enactment provides both a field full of action and a history lesson. Interestingly, during many of the battles, just as they did 150 years ago, ladies sit uphill, taking in the scene while garbed in period dress -- all the way down to their underwear! The attention to detail is incredible in everything the soldiers, women and children wear and do. What draws my attention and my camera the most are the early mornings when everyone is preparing for what's to come and the evenings after the battle. Throughout the camps, they cook, camp, drill and play as if they are truly LIVING YESTERDAY TODAY. I am just starting to work with my images. The most difficult part of the process is trying to make my images look as if they were taken 150 years ago, especially since I am presenting them in color. One solution has been to mute the color and add textures. At every battle I witness, I learn something new, meet wonderful people and see photographs everywhere I turn. I look forward to adding to this portfolio and sharing my work with others.